Friday, February 15, 2008, Safar 7, 1429 A.H. 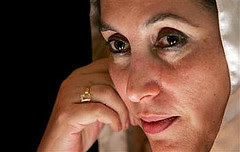 The PPP has expectedly rejected the Scotland Yard report which discussed the cause of Benazir Bhutto's death. Although the British detectives made it clear in the beginning that their assigned task was to find out how the PPP leader was killed, not to investigate about the people involved in it, the PPP leadership did not ask the government for widening the scope of the investigation. Common sense says that it is more important to find out who planned the murder than to determine what caused it.